The Swarovski crystal briolette has had a huge revival in popularity in recent times. The briolette is often, rightly or wrongly called, teardrop due to its shape. The term "briolette" can refer to either the shape or the cut (facet) of the stone. Briolette is shaped like an elongated pear or like a tear drop. It is usually characterized by triangular facet cuts, but not always necessarily so. 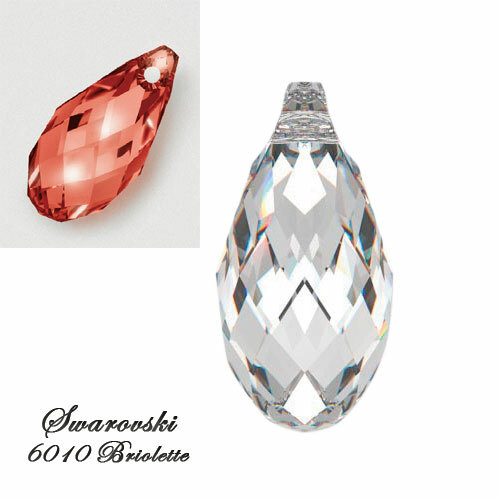 Swarovski offers their 6010 Briolette crystal pendant in a large range of colors and effects, and in numerous sizes. In February 2012, they extended this range to include more of the new colors and effects launched in Swarovski Innovations Spring/Summer 2012. The 6010 Briolette availability chart-matrix below will give you some better ideas as to color-to-size availability. Swarovsky Pendant 6010 Briolette is available in these sizes. Click thumbnails to have a larger version. (Opens in new window). I so happen to have on me some lovely photos of the Swarovsky Crystal Pendant 6010 Briolette in their latest extended colors. (Photo Credit: CREATE YOUR STYLE). This is sure to whet your appetite so be forewarned!